After the nail biting season 1 finale, viewers can look forward to finding out who survived the terrible shoot out rampage by the deranged Tsietsi Namane. The second season of the gripping, fast paced telenovela, will hit our screens in March. The telenovela is set against the backdrop of a family-owned business in Tembisa, Namane Funerals. The funeral parlour is headed by the husband and wife duo, Mandlakazi and Selogile Namane, who inherited it from their parents. The pair have created an empire with the assistance of their children Tsietsi, Monwabisi and most recently, Reba Namane. On the surface all looks well, but the Namane family is haunted by deep, dark secrets, which are constantly swept under the carpet to keep the family intact. “The show played an integral role in launching the 8pm telenovela slot for the channel and viewers couldn’t get enough of it. We are thrilled about the new season of Ashes to Ashes and are sure that it will keep viewers consistently entertained”, said Monde Twala, Managing Director for e.tv Channels Division. The first season allowed the Namane family to reinforce its presence in South African prime time television. In the second season, the changing power dynamics in the Namane family will bring fierce action to the fore. 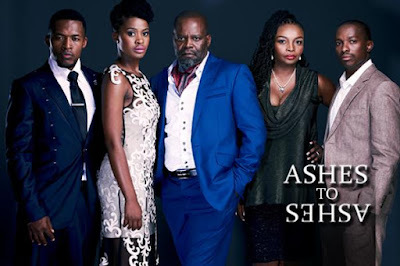 “Ashes to Ashes 2, promises to bring all the thrills, drama, love, hate and the complications that South Africans have come to expect from the series”, said Genna Lewis, Series Producer at Clive Morris Productions. A series of scandalous dramatic moments, lead to the truth about the father of Mpho’s baby being revealed. Shocking events continue to follow the Namane family, threatening the future of the funeral parlour and the Namane family as we know it. Love, support, and unity are put to the test when Selo makes a life changing decision which results in regret and despise. Ashes to Ashes season 2 returns with much anticipated drama, new characters and more grim secrets that will further shatter the family unit. Some of Mzansi’s favourite actors will take on new roles in season 2. Tina Jaxa plays Nokulunga Rhadebe, Mandlakazi’s estranged and feisty cousin. Atandwa Kani is Buzwe Sihlahla, Tsietsi’s no nonsense lawyer. Industry veteran, Nandi Nyembe makes a debut as Detective Nkonzo’s mother, Ma Nkonzo, who has a score to settle with the Namanes. The new talent will join the stellar season 1 cast which includes Patrick Shai (Selo), Nambitha Mpumlwana (Mandlakazi), Zenande Mfenyana (Reba), Menzi Ngubane (Detective Nkozo), Nyaniso Dze Dze (Tsietsi), Chumani Pan (Monwabisi), Nyalleng Thibedi (Mpho), Craig Urbani (Mickey), Maggie Benedict (Violet), Mandla Gaduka (Damien) and Stitch played by Richard Lukunku. Stay tuned for the new season of Ashes To Ashes from Monday, 14 March at 8PM. Ashes to Ashes airs Mondays to Fridays on e.tv. It is also available in HD on eHD channel 104 on OpenView HD as well Channel 194 on DSTV.